Earlier this spring, Russian billionaire Yuri Milner casually announced his intention to develop spacecraft that can travel at up to 20 percent the speed of light and reach Alpha Centauri within twenty years. From the outset, it was clear that no humans would be making the warp jump—the mission will involve extremely lightweight robotic spacecraft. A new fleet of tiny satellites hints at what those future interstellar voyagers will look like and be capable of. Meet Sprites: sticky note-sized devices that sure look like the result of the Pentagon’s long-anticipated floppy disk purge, but are in fact state-of-the-art spacecraft complete with solar cells, a radio transceiver, and a tiny computer. Later this summer, a Cornell-led project called Kicksat-2 will launch 100 of these puppies to the International Space Station. There, the satellites will spend a few days field-testing their navigational hardware and communications systems before burning up in orbit. The project’s lead engineers, Zachary Manchester and Mason Peck, are on the advisory committee for Breakthrough Starshot, an ambitious effort to reach our nearest neighboring star system within a generation. (In fact, the potato chip-sized computer Milner held up during a highly publicized press conference in April was Manchester’s own design.) Sprites, and the “chipsat” technology they’re based on, are a step toward that goal of interstellar travel. More generally, they’re an indication of the future of space exploration. Advantages of being very small and lightweight include the ability reach very high, even relativistic speeds, shaving years off the time it takes to get around the solar system. Combine speed with the inherent disposability of the technology, and you’ve got a cost-effective option for dive-bombing into the plume of Saturn’s moon Enceladus, attempting risky landings on comets, or sailing out of the solar system and beaming information back. That, at least, is the idea. First, the technology needs to be proven in orbit. In 2011, three of the Manchester’s first-generation Sprites were strapped to the outside of the ISS and left to soak up a hefty dose of radiation. Encouragingly, the off-the-shelf hardware was still functioning when astronauts retrieved the devices several years later. In April 2014, Kicksat-1 was launched into orbit in what was intended to be the technology’s first large-scale field test. Unfortunately, after being walloped by a burst of cosmic radiation, the Kicksat-1 container (the thing that looks suspiciously like a CD-ROM tower in the video above) failed to deploy its cargo of 104 Sprites, which fell back into our atmosphere and were destroyed. With the crowdfunded Kicksat-2, Manchester and his collaborators are trying again. Their payload, which is slated to launch on an upcoming resupply mission to the ISS, represents the largest number of satellites ever to be deployed at a single time. 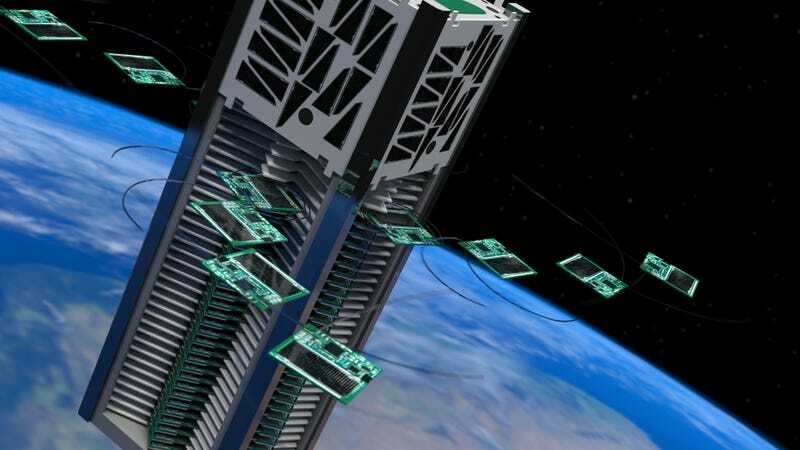 “We’re trying to run a mission with 100 tiny satellites,” Manchester told Gizmodo. A key goal will be to test the Sprites’ communications system, which relies on a protocol called code division multiple access (CDMA)—the same method that a cellphone tower uses to talk to hundreds of individual devices over the same radio bandwidth. Being able to talk with individual Sprites in this manner is a critical step toward to tracking swarms of little spacecraft on a deep space mission. Some of the Sprites on Kicksat-2 also include a tiny loop of wire that generates a small magnetic field when a current is passed through it. “This basically turns the entire satellite into a compass needle, allowing you to align it with Earth’s magnetic field for steering,” Manchester said. We’re still years out from a fleet of spacecraft that are truly capable of pulling off an interstellar voyage. Manchester’s Sprites weigh just four grams, but eventually, Breakthrough Starshot hopes to scale its satellites down to a quarter that size. “The smaller you can shrink the satellite, the less gigantic the laser [propulsion system] has to be,” Manchester said. For a trip to Alpha Centauri, there are also major technological hurdles to be overcome in terms of power storage and long-distance communication. Still, it’s encouraging to see that researchers are already thinking about how we can engineer the cheaper, smaller, and faster technology that’ll eventually allow us to reach new distances and speeds. So, in the interest of one day landing on Europa and crossing the edge of the Oort cloud, here’s hoping that box of high-tech floppy drives has a smooth launch.